"Incretins & Gastrointestinal Hormones: Pre-analytical Considerations"
Testing for incretins, and other gut hormones, presents numerous challenges because of their instability. Therefore, proper sample collection and meticulous pre-analytical and analytical sample handling are crucial for successful quantification of these biomarkers. 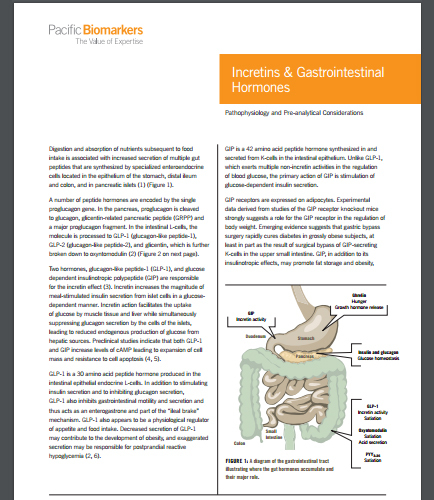 Incretins, which are insulinotropic gastrointestinal hormones, are produced mainly in K and L cells of the small intestine under the influence of nutritional stimuli. What are the significant challenges in the measurement of incretins and gut hormones? What is the best practice for minimizing pre-analytical variability associated with blood collection, processing and storage? What are the additional pre-analytical steps that should be considered when samples are obtained for quantification of active acylated ghrelin? Download this whitepaper that provides insights about the challenges, best practices and major concerns regarding commercial assays for reliable quantification of incretins and gut hormones and specific pre-analytical and analytical processes as well as data analysis to improve sensitivity.